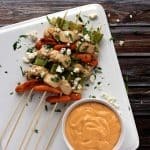 These Buffalo Bleu Cheese Chicken Skewers are the perfect appetizer or main course the next time you’re craving chicken wings! Baby carrots and large slices of celery are roasted while bite size pieces of chicken tenders are browned and sauteed in a delicious buffalo bleu cheese dip. Everything is then loaded onto skewers and sprinkled with additional bleu cheese before serving. Don’t get me wrong, I love chicken wings. They’re the perfect game treat, a great appetizer at a sports bar – you get the gist. The part I don’t like? The mess! I believe it to be impossible to eat a chicken wing in any sort of ladylike fashion. In fact, if you know how to accomplish this, please let me know! So I came up with a plan to enjoy all the flavors of chicken wings but without the mess and possibly even better, without the frying. Crudite included! 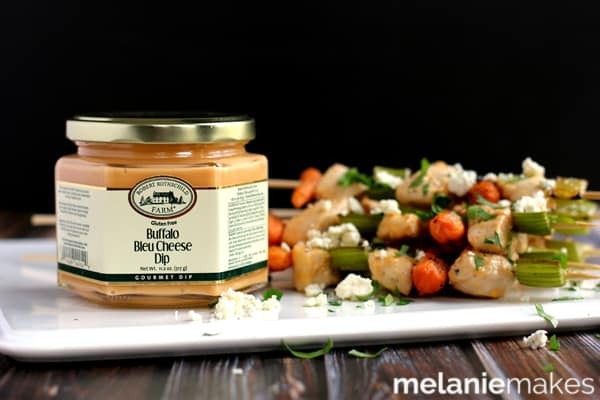 Baby carrots and large slices of celery are roasted while bite size pieces of chicken tenders are sauteed and then tossed with Robert Rothschild Farms Buffalo Bleu Cheese Dip. Everything is then loaded onto skewers and sprinkled with additional bleu cheese before serving. What can I say, I’m a sucker for stinky cheese! And for good measure, extra dip is included on the side. 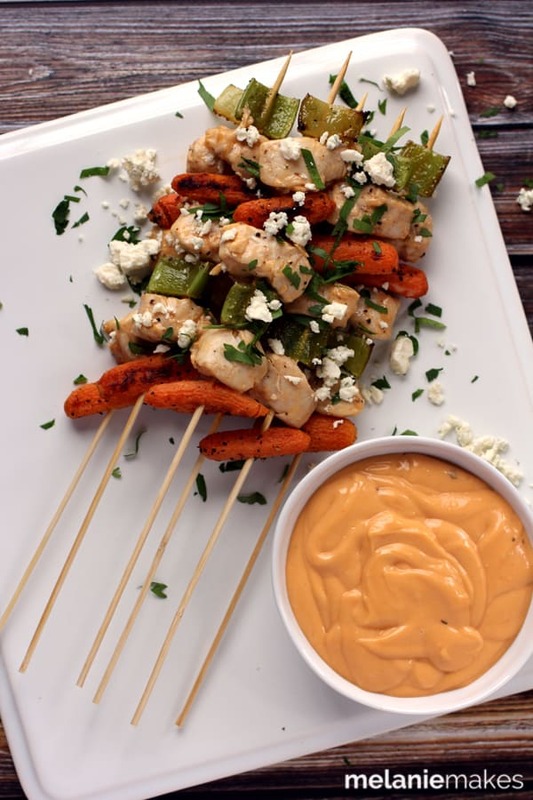 These Buffalo Bleu Cheese Chicken Skewers make for a great appetizer or even a main course. Just think how awesome they’d be served with your favorite potato or even rice! 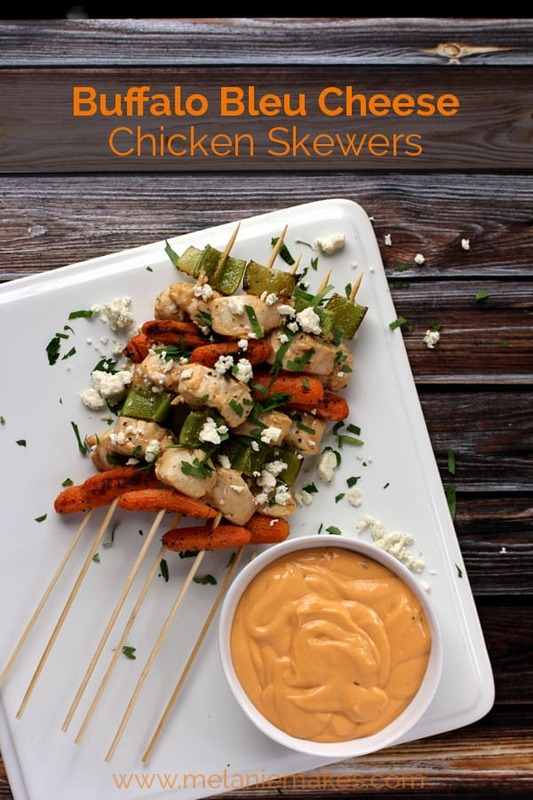 These Buffalo Bleu Cheese Chicken Skewers are the perfect appetizer or main course the next time you’re craving chicken wings! On a baking sheet lined with parchment paper or a silicone mat, place carrots and celery in an even layer. Toss with 2 tablespoons extra-virgin olive oil and season with salt and pepper. Roast for 30-40 minutes or until vegetables are crisp tender and beginning to caramelize. Meanwhile, over medium heat in a large pan, heat remaining tablespoon of extra-virgin olive oil. Add chicken and brown until cooked through. Toss with Robert Rothschild Farm Buffalo Bleu Cheese Dip. On a skewer, add carrots, celery and chicken in desired amounts. Garnish with bleu cheese crumbles and serve with a side of Buffalo Bleu Cheese Dip, if desired. I’ve roasted carrots a million times, but celery? That was something fun to try! It might be my new favorite way to enjoy it as it caramelizes and becomes sweeter as it roasts. To celebrate the upcoming release of their new catalog – of which this recipe will be featured! – the amazing people at Robert Rothschild Farm (Seriously you guys, love them. Love them, love their products.) are allowing me to host a giveaway the eight products I’ll be featuring in recipes through the rest of the month. See the box below for your chance to win. The Peach Mango Coconut Habanero Sauce sounds delicious! The buffalo blue cheese dip for sure! Definitely the The Artichoke & Aged Parmesan spread, it sounds awesome!!! I'm so glad I just looked at this post, this is going to be happening in my house this weekend! 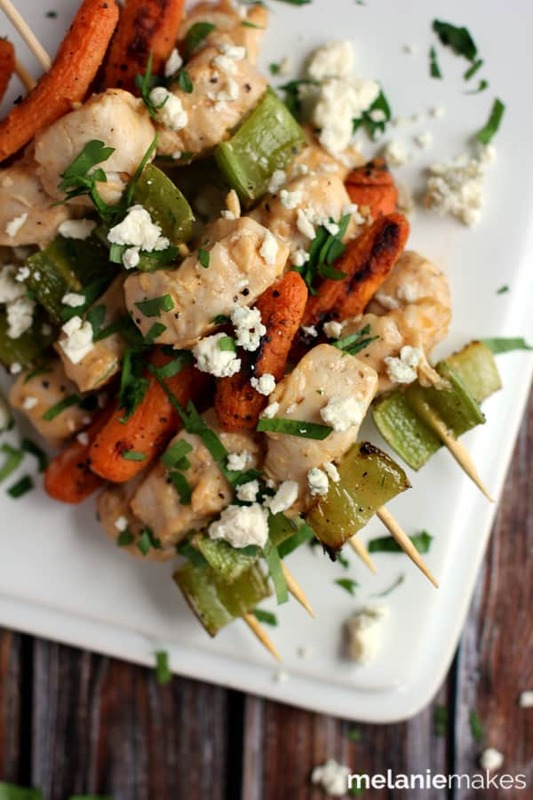 :) Everything about these skewers looks delish! The SnickerKicker coffee, mustard and bleu cheese dip top my list. 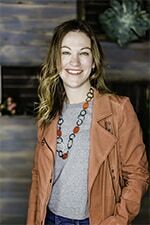 Love their products! A friend sent me to your blog. I just pinned these, and you have a new subscriber. Thank you! Well, a big thank you to your friend, Jenna! Thanks for the Pin and for subscriber - so happy you stopped by! Wow! Hard choice, but I think I would try the Balsamic Caramelized Onion Spread first. I love balsamic! It would be a toss up for me on which to try first - either the Sweet Fig and orange spread or the Peach Mango Coconut Habanero Sauce. I would love to try the Snickerkicker Coffee! I'm a coffee nut! I just love this, Melanie! :) I am such a sucker for ANYTHING Buffalo sauced. Pinned & sharing!